Wales' European Championship title hopes were ended by a 42-22 defeat to France in Albi. The visitors trailed 24-6 at the interval with Dan Fleming scoring Wales' try while France scored four times. France extended their lead with Remy Marginet scoring two tries and Mathias Pala adding his second of the game. Matty Fozard, Rhys Williams and Christiaan Roets crossed for Welsh tries but France proved too strong. 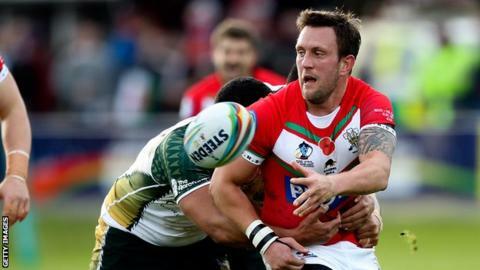 North Wales Crusaders' Owain Griffiths became Wales' 500th capped player when he came on as a replacement during the first half. John Kear's side suffered a 42-18 defeat to Scotland in Workington in the opening round of games. Wales, defending champions after their win in 2010, face Ireland in their final game of the Championship at Wrexham's Racecourse on Sunday, 2 November. "I was impressed with them, at 42-6 down you're looking down the barrel of an embarrassment but that didn't happen and they showed some true Welsh spirit and passion and fought their way back into the game. "The pleasing thing for me was this was what we were trying to do for the last game and the first three quarters of this. "They're very young and they need some confidence and the only way that you can get confidence is to play against good teams and France were a very good team."